Now is the Time to Observe Mars! Image credit & copyright: NASA/JPL/USGS of Mars’s Schiaparelli Crater (front & center) by the Viking 1 Orbiter. If you’re a fan of the night sky, you’ve been noticing the trio of Jupiter, Saturn and Mars rising one at a time in the East as it’s been quite a treat for the past few months. If you haven’t seen this yet I would urge you to do so because it’s a fantastic view that’s at its peak right now. Jupiter reached opposition back on May 8. Saturn reached opposition on June 27 and on Friday, July 27, 2018 Mars will attain its closest opposition since August 27, 2003 (which was its closest opposition in 60,000 years) and will be its closest until September 15, 2035 though unless you’re a planetary imager the exact date and time of opposition doesn’t really matter. 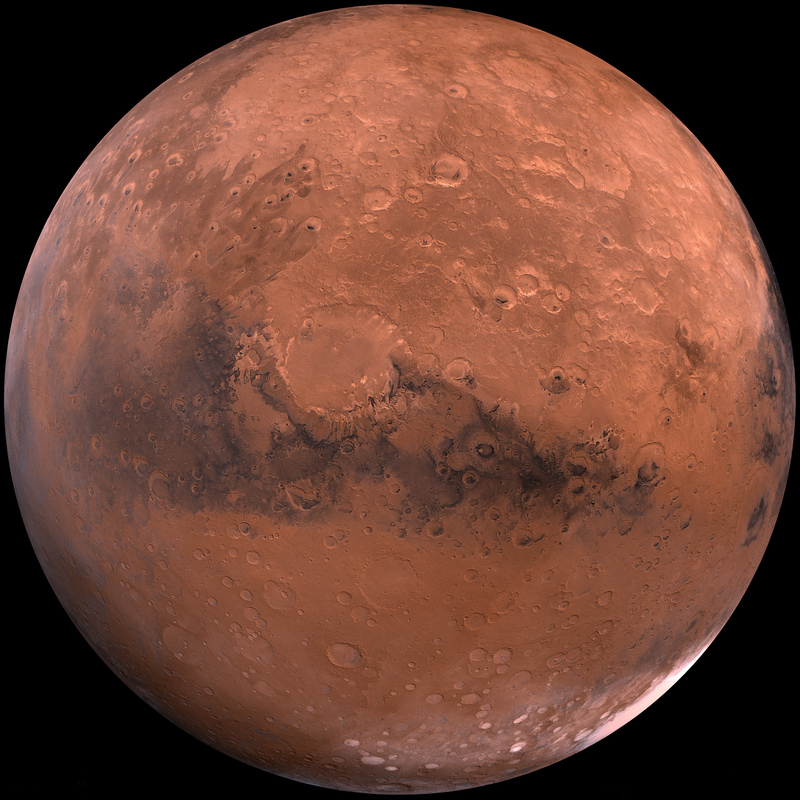 Mars reaches opposition about every 2 years (26 months, or 113 weeks or 791 days) and in addition to that, every 15 or 17 years opposition happens within a few weeks of Mars perihelion or Mars closest point to the Sun in its orbit which means its closer than a normal opposition. This opposition will bring Mars to within 44 million mi. (70.8 million km) from Earth. That’s not quite as close as the 2003 opposition but it’s the closest one since then. And if you’re wondering, that 2003 opposition distance of 34.6 million mi. (55.8 million km) will stand until August 28, 2287. To help paint a picture of the vast distances in our solar system, when Mars is at its furthest point from Earth (known as conjunction) on the opposite side of the Sun its roughly 2.65 AU (250 million mi. or 401 million km) from Earth. NOTE: Please don’t believe or share any ridiculous hoaxes in regard to the opposition of Mars. Even at its closest for example, it will be 24.4” arcseconds in diameter on our sky which is still very small. Jupiter for example is 44” arcseconds at opposition and the Sun and Full Moon is about 1,800” arcseconds. On the night sky it’s certainly brighter than usual but through a telescope you still see some dark regions and some polar caps mixed in with the red that’s about it. NOTE (Take 2): The same night that Mars reaches opposition, we (some of us) will experience a total lunar eclipse. In fact this event will be the longest total lunar eclipse of this century, so if you have an opportunity to experience it, please do. My post on the event will be forthcoming. Jeffrey Beish illustration of the 2018 apparition of Mars showing the approach as Mars comes out from behind the Sun grown larger until opposition and then gets smaller as we bypass it and leave it behind. Also, during the immediate hours of opposition look for a phenomenon known as the Seeliger Effect; also known as Opposition Surge, Opposition Effect or Opposition Spike. This is a sudden brightening of the planet (especially Saturn and the Moon) right before through right after opposition. The main culprit for this phenomenon seems to be coherent backscattering and shadow hiding. To use the Moon as an example of shadow hiding; just hours before full moon, the suns light is hitting the lunar surface squarely and almost all major shadows on the lunar surface from our vantage point are gone. When this occurs the Moon can brighten by about 40 percent and usually lasts until a few hours after full phase. When this happens during an opposition of Saturn for example, the rings actually become brighter than the planet itself for those few hours. Apparent Size (Angular Size): 24.4” arcseconds and 100% illuminated. For perspective Jupiter is around 44” arcseconds at opposition. Image | This entry was posted in Astronomical Events, Astronomy (Learning), Images, News, Solar System and tagged Astronomy, Mars, Mars Opposition, NASA, Opposition, Solar System, Viking 1. Bookmark the permalink. 1 Response to Now is the Time to Observe Mars!